I had a what turned out to be a very expensive trip to a bar a few weeks ago. No, I wasn’t overserved nor did I need to cab it home from a remote location. It became expensive because I watched TV there. The picture was noticeably better than what I was used to and it turned out that I was watching a 4K TV with full High dynamic range, or HDR. Even though the program (a basketball game) wasn’t in native 4K, it was noticeably better. Once I figured out that DirecTV, my TV provider, has a few 4K channels and that some sports, including the upcoming Masters, are shown in 4K, I was hooked. I did some research and found that one of the top-rated sets was on sale (almost half price!) and two days later, and hundreds of dollars for the TV and a new DirecTV box that handles 4K, my viewing experience was upgraded. One thing that I got along with the upgraded picture (even standard HD looks better) was a built-in Roku device. I’ve had a Chromecast for years and I also have my Xbox hooked into the TV. I have been using both for “over the top” viewing of streaming services like Netflix, Hulu, and Amazon. What has changed with the Roku is that all of these services and many others are available as channels on the TV. There’s no need to switch inputs or fire up another device as I have been doing. Which reminded me of a couple of things. First, the lines between “TV” and “video” have vanished forever. One can argue that once consumers had remotes and DVR‘s they morphed into active programmers but with what is now the almost full integration of TV and OTT, making an unlimited amount of content available in high-quality video, it’s now all just TV. The second point, one which might apply to your non-media business, is that consumers don’t care about the tools or the labels. They do care about control since they now have complete control in many areas of their consuming lives, or at least a lot more than they used to. You can fight this (broadcasters did for years) or you can facilitate this, but hanging on to an antiquated business model is the wrong choice. Disney will launch an ESPN-branded streaming service in a couple of weeks. Since to me and many others there is no difference between traditional TV and streaming video, it will be just another channel on my TV (hopefully in 4K). For many cord-cutters, it will be a nice addition to their programming options. Disney has learned that the tools (or channels) are immaterial and the business model needs to continue to evolve as do consumers’ habits. Have you? As you might have guessed from the name of my company (Keith Ritter Media), I’ve spent a great deal of time in the media business, both as a marketer and as a publisher. The business model used to be pretty simple. Create something about which people care, make them aware that you’re offering it, get them to read, listen, or watch it, and aggregate those people into a saleable audience. You hired salespeople to meet with the representatives of your real customer – the advertiser. Usually, these representatives were media buyers from an ad agency. You with me so far? In TV, we’d offer a unit of time at a “gross” price and asked the agency to remit a “net” price, which was usually the gross minus 15%. That commission was the toll we paid to get the revenue. Obviously, how much of that the agency kept was between them and their client but it wasn’t really our concern. We did our budgeting on the expected net revenues we’d get which was pretty much a straight line derivative of the gross monies sold. Other media had similar models but in every case, the dollars received by the publisher were directly and clearly tied to the size and desirability (to marketers) of their audience. That statement in no longer true for digital publishing and the fact that it isn’t has serious negative implications for other media as they shift to a more programmatic sales model. I have no idea how digital publishers are able to do financial plans since they can’t project revenue from audience size. That’s because they’ve allowed themselves to generate billions of dollars in ad revenue while only capturing somewhere around a third of what is spent. The 15% that used to be paid in tolls is now more like 67% although some estimates are even higher. More importantly, it’s usually impossible to predict the net revenues received from the gross revenues sold. Digital audiences are growing while publisher revenue is declining. Where is the money going? A sponsor pays $1 for an ad impression. The agency still takes their commission, but added to the toll-takers are trading desks, DSP providers, data providers, supply side platforms, ad serving platforms, verification services (viewability, etc.) and who knows who else. In some cases, it’s the agency double-dipping, but most of the time these are third parties. Most of these ad services have no interest in either the publisher’s or the marketing client’s success. They aren’t about a quality ad environment. They facilitate a transaction. In some cases, a platform that connects both buyers and sellers charges each side a separate fee without disclosing that they’re doing so. In short, publishers, agencies, and marketers have created a system that works for no one but the VC’s that fund these ad tech companies. What happens when programmatic spreads to other media such as TV? Publishers have many other challenges. Facebook, for example, makes more money off of some publishers’ content than do the publishers themselves without paying the publishers a dime. But the real threat to a healthy media environment is the toll-takers. When you create great content and grow your audiences, you should be the entity that benefits and not some opaque service provider. More eyeballs used to mean more money to the bottom line. Can we make that equation true again? When I was in the TV business, the most sought-after demographic was always young adults. While they often weren’t the key to the heaviest volume of product sales, it’s when we’re young that we build consumption habits and establish brand loyalty. Let’s keep that in mind as we look at some recent trends in media. MoffettNathanson analyst Craig Moffett has noted that 2016’s 1.7% decline in traditional cable TV viewers was the biggest cord cutting acceleration on record. SNL Kagan agrees, noting that traditional pay-TV providers lost around 1.9 million traditional cable subscribers. That was notably worse than the 1.1 million net subscriber loss seen last year. They also noted that those numbers don’t tell the entire – and much worse – story. Those numbers report those who canceled an existing subscription. When you take into account the youngsters moving out of their parents’ houses or graduating from college and forming their own household for the first time, there are around another million “cord nevers” who are missed sales by the traditional cable and satellite providers. It really doesn’t matter what business you’re in. When you stop attracting younger consumers, you have a problem. The majority of consumers in the U.S. and Canada are no longer interested in hefty pay TV packages filled with channels they don’t watch. According to a new study from TiVo out this morning, 77.3 percent now want “a la carte” TV service – meaning, they want to only pay for the channels they actually watch. And they’re not willing to pay too much for this so-called “skinny bundle,” TiVo found. The average price a U.S. consumer will pay for access to the top 20 channels is $28.31 – a figure that’s dropped by 14 percent over the past two quarters. There is also the matter of convenience and personalization. Netflix, Amazon, and other streaming services do a great job in making recommendations and offering you programming based on your viewing habits. Has your cable operator done that for you lately? We can learn from this. Cable operators who focus on broadband and “throw in” the TV offerings aren’t doing much better than those who don’t, since the overall out of pocket is sullied by broadband caps and other, often hidden, price increases that help the bottom line but only prolong the inevitable. It also just makes it easier for a lower-priced competitor to enter the market. I know enough about how the TV business works to recognize the issues with skinny bundles (it’s hard to offer channels on an ala carte basis due to contractual restrictions). We’re seeing more and more offerings that bundle channels outside of the traditional providers and that’s going to exacerbate the aforementioned trends as well. What’s needed is a rethinking of the business model. Getting local governments to preclude more broadband competition isn’t a long-term solution (look at the wireless business!) nor it is the “free and open market” to which most businesspeople pay homage. Listen to your consumers and give them what they want, especially the young ones. Cord cutting isn’t some far off fantasy that naysayers have dreamt up. It’s here, and it’s killing you by 1,000 cuts. The rest of us can learn from this and, hopefully, not make some of the same mistakes. You agree? I’ve written a number of times over the last few years about the changing patterns of content consumption and how those changes are affecting the media business. I read some statistics last week that make me think we’re almost at the tipping point where we’ll see some irreversible things happening that affect not just media but marketing as well. New findings from GfK show that US TV households are embracing alternatives to cable and satellite reception. Levels of broadcast-only reception and Internet-only video subscriptions have both risen over the past year, with fully one-quarter (25%) of all US TV households now going without cable and satellite reception. TV households with a resident between 18 and 34 years old are much more likely to be opting for alternatives to cable and satellite; 22% of these homes are using broadcast-only reception (versus 17% of all US households), and 13% are only watching an Internet service on their TV sets (versus 6% of all TV homes). Overall, 38% of 18-to-34 households rely on some kind of alternative TV reception or video source, versus 25% of all homes. The inescapable reality is that TV advertisers are 20th-century companies: built for mass markets, not niches, for brick-and-mortar retailers, not e-commerce. These companies were built on TV, and TV was built on their advertisements, and while they are propping each other up for now, the decline of one will hasten the decline of the other. 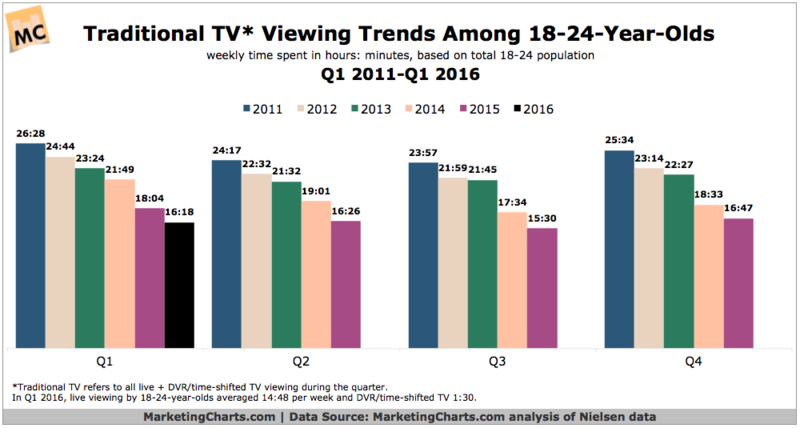 As you can see from the chart, viewing of traditional TV by young people in the first quarter of this year (traditionally a high-viewing quarter as many people stay inside during winter) dropped precipitously. There aren’t many mass markets and there really aren’t mass media. Why, then, are we focused on measuring things that are no longer really relevant? Anyone?